Tasty Ocean FishHelps maintain urinary tract healthBalance of Omega-6 & Omega-3 fatty acidsBest fibre source promoting a healthy gut and small stool volumeExcellent nutrient absorption for optimal use of all ingredients. Iams Adult Cat Ocean Fish has high quality ingredients that create a taste sensation your cat will love and also ensure she gets all the nutrients she needs. Each meal time is packed with a high content of animal based protein and specially selected natural ingredients with added vitamins and minerals. 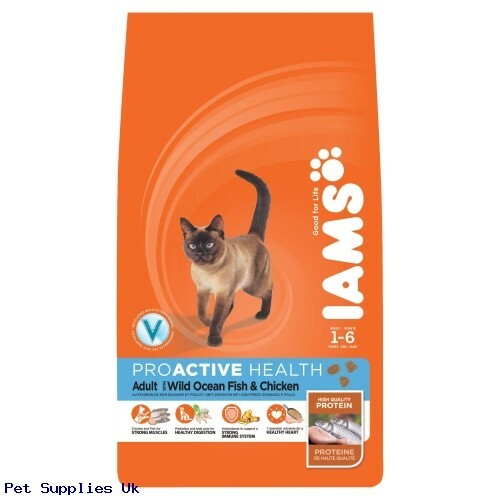 Iams Adult Cat Ocean Fish contains no added colours, flavours or preservatives; however it does contain vitamin E to support the immune system and Omega 6 and 3 fatty acids for healthy skin and shiny coat. Ingredients: Ocean Fish (>26%), chicken meal, rice, maize, animal fat, dried whole egg, dried beet pulp, poultry digest, brewer's dried yeast, potassium chloride, DL-methionine, sodium chloride.